Emotions ARE management’s business. The cost of lack of emotional intelligence at work is huge in terms of staff turnover, low work output, stress, mistakes and poor customer service – but they often go unnoticed. As you talk to one of your staff about how the new invoice system’s going, you notice a tone in their voice or a look that gives away the fact they’re having trouble with it. There are feelings here. And it’s the manager’s job to find out how they’re getting in the way of the job – and help them to deal with it. This is human kindness. But it’s also practical business sense too. People can’t focus and do good work if they’re distracted by strong emotions. It’s at the ‘feelings’ level where many performance and productivity problems lie. To do something about it, you need to connect with feelings. And this takes ‘emotional intelligence’ (EI). The basic business case for EI is simple. Good moods equal good work. Bad moods are bad for business. As a manager, you exert a powerful emotional pull on the feelings of your people. Your moods can deeply influence the way other people feel about work, the workplace climate and ultimately performance and productivity. When leaders manage emotions positively, they inspire extra effort and focus. They resonate and bring out the best in others. The reverse applies too. Managers who use emotions negatively cause dissatisfaction, demoralise and sap the spirit of their staff. We also know now that every decision we make is directly influenced by emotions. In fact, without feelings, our decision-making ability is impaired. So much for rational decision-making!. Feelings percolate through every aspect of working life. They affect how well we do in terms of reaching our goals, task-concentration and forging good work and business relationships. Yet many managers still see the idea of tuning into emotions at work as a hindrance to rational business practice. Feelings are put in the ‘too hard’ (or is it the ‘too soft’?) basket. Many managers maintain feelings have nothing to do with the objective bottom line or getting good business results. Faced with strong feelings, one response is to work at ‘staying rational’ and keeping ‘messy emotions’ that ‘cloud good judgement’ under control. Even if you’re in tune with your feelings, you may still feel uncomfortable to express them at work. Many managers think it might typecast them as weak, undisciplined or vulnerable. Funnily enough, ‘motivation’ and ‘emotion’ both come from the same Latin root word – motere –meaning ‘to move’. Emotions are what move or motivate us towards an action or goal. If emotions fuel motivation and drive action, managers need to start seeing EI as an indispensable tool for great leadership! We’ve all seen it in action. There’s the sales-person who gets along so naturally with everyone, doesn’t push and always manages to close. 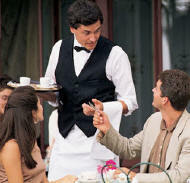 There’s the waiter who handles difficult diners effortlessly. There’s the manager who builds such strong bonds with staff that they can fire them up to do almost anything. And, the most critical element…connecting with others or ‘empathy’ – the ability to understand the emotional makeup of other people and deal with their emotional responses appropriately. 1. Self-Awareness – is being fully mindful of what I feel in the moment and using that to guide how I choose to behave or respond. If I’m not in touch with my own feelings, I won’t be good at controlling them – or reading other people’s. 2. Self-Management – is how well I can control or regulate my emotions to keep them in balance – especially negatives ones. If I’m out of touch with what I feel, I’m at the whim of my feelings – and my feelings control me – especially powerful ones like anger, frustration or panic. 3. 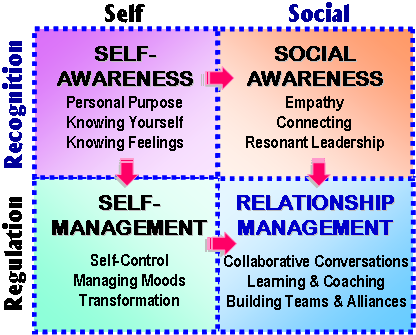 Social Awareness – includes the most powerful of emotionally intelligent management practices: empathy – the ability to read how others are feeling, step into their perspective and relate to others – without allowing yourself to be hijacked by someone else’s feelings. 4. Relationship Management – means building enduring, positive relationships and using the other EI dimensions to persuade, lead, negotiate, collaborate and network. These dimensions are closely tied together. For example: emotionally intelligent managers monitor their moods with self-awareness, control them with self-management, understand the impact they have through empathy and act in ways that resonate well with others' moods through relationship management..
Building bonds: Leaders neglecting to build strong teams or networks of cooperative, mutually supportive relationships. As Goleman explains, while all the failed leaders were intellectually and technically very high achievers, it was almost as if "the IQ muscle strengthened itself at the expense of the muscles for personal and social competence". We’ve now identified the brain-part that triggers emotions. It’s the amygdala – an older, more primitive part of the brain that developed before our new thinking part – known as the neocortex. The amygdala handles all basic emotional reactions (eg. fear and anger). It can by-pass our thinking brain and generate feelings so we can react rapidly – which serves us well as a survival strategy. 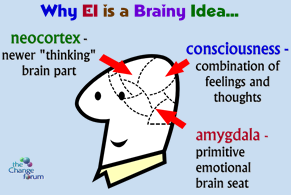 A key idea for EI is the ‘emotional hijack’. Our brains are hard-wired to feel first, think second. When triggered, our ‘feeling’ brain overrides our ‘thinking’ brain. Under the influence of strong feelings, we react automatically – summed up when we say: "I didn’t think about it – I just acted instinctively." The trick is to get the thinking part of our brain engaged – to let our ‘better judgement’ in – not by ignoring our feelings but by paying attention to them: naming the thoughts and feelings that escalate emotional take-overs. This is what Goleman calls emotional self-regulation. The practice of EI at work provides managers with a whole new set of tools and techniques for motivating staff, keeping themselves positive under pressure and building a better and more productive work climate for your business! A growing body of research on the human brain proves managers act as emotional amplifiers for the people around them. As Daniel Goleman (2002) says: "all eyes turn to the leader for emotional guidance" – especially in times of pressure or stress. If a manager’s mood sways the feelings of others and has a big impact on workplace performance, then being able to manage your moods – remaining positive, balanced and supportive – is a productivity necessity. You tune in to the feelings of staff – read their emotions, empathise with them and sometimes voice them on their behalf. Our emotional state is picked up by others and creates the same feelings in them – they resonate with us. This too, is a biological process called ‘entrainment’. People feel acknowledged, understood, cared for – which can help them regain energy and focus, get themselves out of the doldrums and make work more meaningful. Dissonant leadership is when managers are ‘out of touch’ with the feelings of their people. Lacking empathy, they act in ways that set off negative emotional chain-reactions in others. In dissonant workplaces there is excessive anger, fear, high anxiety or sullen silence. Things just feel continually ‘off-key’ – and there’s little laughing or fun. Dissonant managers create toxic climates. Their conversations are laced with cynical contempt, sarcasm, put-downs, personal attacks and other kinds of aggressive behaviour that create distress. 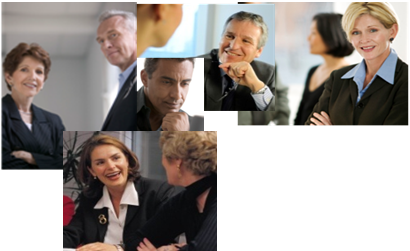 Dissonant managers come in many guises – from dictators, bullies, coercers and polite manipulators to those who are oblivious or just don’t care about how people feel – but they all have some things in common: they lack empathy; they lack a sense of how they come across and impact on others; and they have touchy, defensive triggers. "Emotions may spread like viruses" amongst working groups. Buoyant moods boost performance. But when people feel down, concentration lapses, mistakes increase and work is likely to be less productive than when they feel good and work at their best. Managers who come to work constantly cranky or get exasperated at the drop of a hat can create a toxic climate if this continues over time. EI doesn’t mean giving feelings free reign – letting them run amok or using them to manipulate, stand-over or emotionally blackmail others. It’s managing your moods – expressing what you feel constructively. Name your feelings: Emotionally intelligent managers in touch with their feelings can name them. They know the triggers that activate them, they know the thoughts that fuel them -- and through this process of naming feelings, they can control them. Minimise emotional hijacks: Managers unaware of their own emotions can’t control their feelings -- their feelings control them. This is an ‘emotional hijack’ -- getting swept away by anger or paralysed with panic. You can’t stop these brain-driven feelings but you can minimise their disruptiveness. Thought-changing: Thoughts fuel feelings -- so one effective technique is to change the thoughts that give rise to negative feelings. Expressing feelings: One of the hardest tasks for many managers is being open and honest with yourself and others about what you feel. People look to their leaders to set the emotional tone by talking about feelings. As a leader, your feelings are important. People want to know what they are. Learned optimism: If your moods set the emotional work tone, productivity will be better if you’re ‘up’ rather than ‘down’. This means replacing ‘learned pessimism’ with learned optimism. Notice the word ‘learned’ -- the way you feel is conditioned behaviour, and you can learn to change or moderate the way you manage your feelings -- around deadlines, performance pressure, setbacks, failures, scarcity, challenges, etc. Exercise empathy: Empathy is not about being nice to others. It’s about being able to see where someone else is coming from (even if you don’t agree with it). Empathy makes practical business sense. People can’t focus and do good work if they’re distracted by strong emotions. Leaders lacking in empathy often act in ways that further antagonise or upset people and create more dissonance. Emotional Intelligence is what enables us to pursue and achieve our goals, helps us to focus and see tangibly how a leader’s feelings and moods affect their own success and the productivity and performance of others around them. What’s the emotional climate like around your workplace? Boyatzis, Richard E. and McKee, Annie 2005, Resonant Leadership: Renewing Yourself and Connecting with Others Through Mindfulness, Hope, and Compassion Harvard Business School Press, Boston Mas. McKee, Annie, Boyatzis, Richard, Johnston, Frances 2008, Becoming a Resonant Leader: Develop Your Emotional Intelligence, Renew Your Relationships, Sustain Your Effectiveness, Harvard Business School Press, Boston Mas.